"Dear friends, here we are, and here we must stay. Let the boundaries of this village become our whole world. Let none enter and none leave while this Plague lasts." In the book Year of Wonders, the charismatic rector Michael Mompellion implores the villagers to stay and not spread "the seed of the plague" outside of the village, and most agree to this self-imposed quarantine. But they are ill prepared for their fate and the depth of how all this hideous sickness and death will affect them. The descriptions of the plague are riveting; I knew so little about the particulars of this dreadful disease before reading this book, which starts as a fever or cough, "marks" victims with a large, painful, grotesque boil that appears suddenly, and progresses so rapidly that many victims would die within a couple of days. It's a very moving novel, based on the true story of the English village of Eyam, although the book blends historical fact with fiction. Some believed that the plague was God's judgement on the sinful world, and pleaded for forgiveness or self-flagellated; others questioned this, and looked to science for prevention and cures. The 1660s were the beginning of the age of modern medicine and the Age of Enlightenment, and in England, there was a shift from Puritanism to the ideas of the Restoration, so many questions about the role of faith are featured in this book. 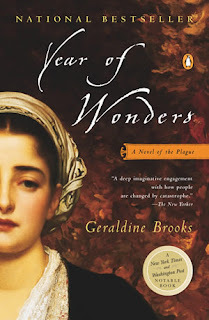 Year of Wonders deals with a most horrific subject and presents an unforgettable portrait of an isolated village outside of London during 1665-1666, which lost two-thirds of its inhabitants to the plague. The effects of all this loss are as widespread as the plague, causing some villagers to become more selfish, fearful of ghosts and witches, hateful, and murderous, while others, such as Anna Firth and Elinor Mompellion, become herbalists and healers who help ease the suffering, or Michael Mompellion, who serves those afflicted untiringly. I'm finished reading this haunting book, and may read more from this author, such as her book March, the fictional story of the father of the girls in Little Women, who leaves his family to fight in the Civil War. On a different note, today's quest will be to obtain a copy of Nicholas Sparks' new book, The Lucky One, which is being released today. Wish me luck! Will Year of Wonders lead to squeamishness if I read it? I'm not sure I'm ready for it. But good luck getting the latest Nicholas Sparks book! Tonight, I'll start my new romance by Nicholas Sparks, The Lucky One! I'm guessing that means you were able to buy it. Congratulations! Christie, his romances are actually quite touching. Have you read The Notebook, or A Walk to Remember? I've never been a fan of romance novels, except for those by Nicholas Sparks. There's more to them than you might initially think.